The Photoshop Levels dialog box allows you to control the tonal values of an image much more precisely than you can with the Shadows/Highlights controls. 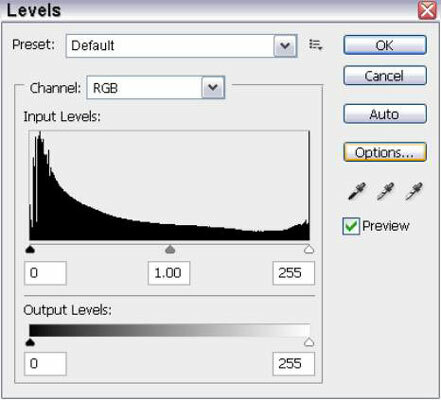 The Levels dialog box shows a histogram graph, which is similar to the histogram you can view on the LCD (liquid crystal display) of your dSLR after you take a shot. 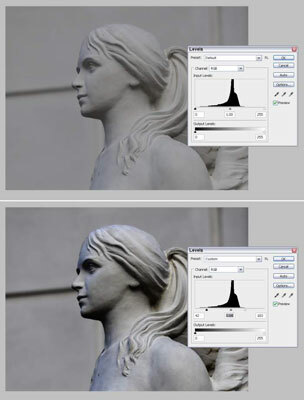 Your camera histogram shows you only whether all the tones are being captured, and you can do little other than adjust exposure up or down or perhaps make a tonal setting change in your camera’s menus. The one in the Levels dialog box (choose Image→Adjustments→Levels) actually lets you change the tonal values. As you might know, a histogram is a graph that shows the relative number of pixels at each of 256 brightness levels. The more pixels at a particular brightness, the higher the bar at that level. Histograms provide a mountain-range-type curve with most of the tones located at the left, and fewer trailing off toward the middle tones and light tones (right side). Move the black triangle to the right until it touches the edge of the black tones actually present in the image, as shown in the graph. Move the white triangle to the left until it touches the edge of the actual white tones. You can move the middle gray triangle to lighten or darken the overall image by adjusting the midtone position. The top image is entirely too flat and lacks contrast. You can see that all the tones in the histogram mountain are clustered in the center. The black point at left and white point at right are too far from the base of the slope where the dark and light tones (respectively) trail off. In the bottom image, the black point is moved toward the center, to the point where portions of the image that actually should be black reside. The white point triangle has also been shifted toward the center, where the white tones are located. The adjusted photo has more contrast and a better range of true dark and light tones. If you remember these basics, you can improve your images significantly without understanding the additional fine-tuning capabilities of the Levels dialog box.